Well, last week I had an epiffany. One morning I woke up suffering from the worst allergies (I don't like Spring) and decided to call it a "sick day", and curled back in bed. I glanced over at my husband getting ready for work and noticed that he was wearing the SAME black suit, with the SAME white shirt, and BORING tie. Then, I glanced at the closet and noticed it was full of great shirts, ties and suits. I screamed, asked sweetly, "Why don't you ever wear that check shirt?" He huffed, lovingly said, "I don't have anything that matches it". I thought- yes and you do, you just don't know how to put the outfit together. And Viola!! My idea for the BEST FATHER'S DAY GIFT popped into my head. I'll mix and match his clothes for him so that I don't have to see him wear the same outfit over and over so that he can easily choose, and wear, a perfectly paired outfit. He left, I popped an antihistamine and decongestant, and sprung into action. I had 5 suits, 9 shirts and 16 ties to work with. I came up with 200+ outfits. My husband came home from work and exclaimed (he really did exclaim), "This is the Best Father's Day Gift!". So, I pass this great gift idea on to you, my friends... Now, did it take some time to do? Yes... Are there things I could have done to make it go faster, or at least a little easier? Yes... Here are some tips on the "how tos" to create the "Best Father's Day Gift". 1) Let Technology be your friend!- Had I thought about this earlier I probably would have kept my husband's phone and downloaded one of the many apps out there. I've used StyleBook before and it's been easy to use. While I think it most likely would've taken the same amount of time to take the pictures, the difference would be that he now would have a digital catalog of all the items he owns, and can access the pictures anywhere, anytime and even add / delete pictures. 2) Make it a Family Affair- The more people there are to do the work, the faster it will go. It's a great kid-friendly Father's Day project. 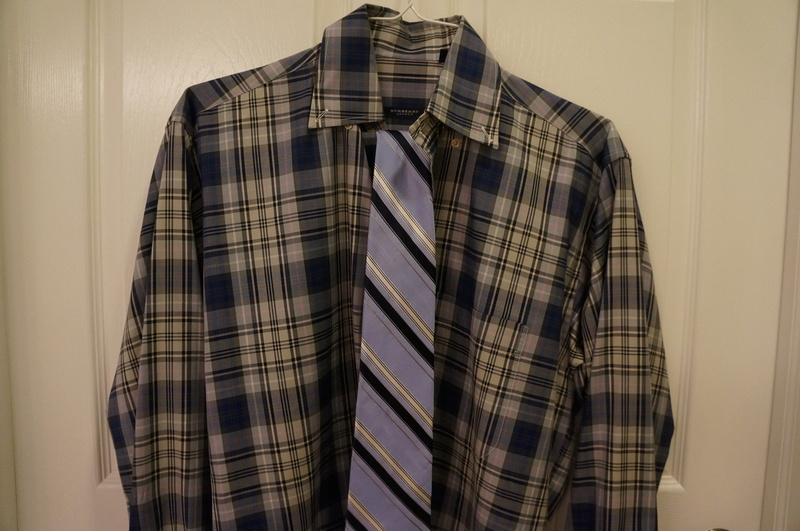 Depending on what is age appropriate for your little one, you can have them count the clothes, name the colors, sort the ties and shirts, work with you on matching colors and even be your little gopher by having to find and get "the green tie" or "blue shirt". 1) Pattern to Solid Ratio- If the man in your life is P.Diddy, Johnny Depp or an uber cool guy, having 3 patterns, meaning a pattern suit, pattern shirt and pattern tie, will work. Or, if he's comfortable with it, then go for it! But, if he's in the middle or even more conservative usually 0 to 2 patterns work fine. Feeling a bit conservative? Go for 3 solids. Want to step it up a bit? Go for 2 solids and a pattern. Taking it up, but not quite the P.Diddy level? Go for 1 solid and 2 patterns. 2) Color / Pattern Match- I'll admit that putting together men's clothing can be a bit intimidating with all the various patterns, colors etc. Easiest thing is to find a common core color in both items and match those. For example, if you have a thin blue stripe shirt and a blue and pink stripe tie, the core color is blue and they match up with each other. But, also be careful with the pattern. You do not want to just stick two core colors together, think of the scale of the patterns and make sure they work together. Anyone have other ideas on how to mix and match suits? I'd love to hear them. Wishing all a Happy Father's Day! Posted on June 14, 2013 by Monisha Kapur and filed under Uncategorized and tagged Father's Day Gift Idea How to Match Mens Clothing Kid-Friendly Mix and Match Pattern Suit Pattern Tie.